There’s actually great wisdom in seeking to have less money. Before we enter into a potentially lengthy and superfluous discussion about how one should live a life of poverty, it would seem appropriate to make clear why one would even want to be poor in the first place. Given that it is pretty much the antithesis of what most in the modern western world would consider to be a worthwhile life pursuit, it’s a fair question. Why would one want to spend their life trying to be poor? I believe that there are at least four reasons for each and every Christian to consider. As we prepare for Christmas in this season of Advent, we recall that Jesus became flesh not in a castle but in a dirty manger; we recall that the first people to visit him were the shepherds, the ritually and materially “unclean” outcasts of society. Jesus coming in this way is an example of how he “emptied himself, taking the form of a slave.” As Christians, those who follow Christ, we wish to be like Jesus by imitating his simplicity and humility; as Franciscans, those who follow Christ in a very literal sense, we wish to be like Jesus by imitating his material situation as well. While the next post will discuss how we do that (because in some ways it might actually be inappropriate to adopt a literal approach) the point remains: Jesus was poor and we want to be like Jesus. That being said, there are a number of things that Jesus did that we’re probably not all called to imitate, e.g. die on a cross. Because of that, we must look to his words and exhortations. When Jesus called his disciples to follow him, “They left everything and followed him” (Lk 5:11, 5:28, 12:33, 14:33, 18:22; Mk 1:16-20; Mt 4:18-22). Leaving their nets, money, family ties, prestige, and occupations behind, the disciples became poor in order to follow him. When he sent them out, he told them to go without walking stick, sack, food, money, or second tunic (Lk 9:2, Mt 10:9, Mk 6:8). And what did he preach to the people? “Blessed are you who are poor, for the kingdom of God is yours” (Lk 6:20). Given the religious climate of the Pharisaical purity laws, it would have been revolutionary enough to say that the poor were more than worthless afterthoughts of God. To say that they were blessed, that there was something particularly special about their situation, was something so cataclysmic to our fallen nature that I believe it has yet to be fully realized in the Church. The poor are special, not in their relation to our charity, but in the very fact that they are poor. 3. We seek justice against a corrupt system. Because of that, there is an important distinction that needs to be made in order for us to live Gospel poverty appropriately and to relate to the poor compassionately: poverty that promotes virtue, which should be imitated, and poverty that demoralizes and dehumanizes, which should be eradicated. An excellent reason to remain poor is to take a stance against unjust systems that do not allow authentic human development and to stand in solidarity with those affected. The way we eat, save, spend vote, travel, reside, and shop all have an impact on the poor. Do we ever stop to wonder how the way we live is possible? How else could our t-shirts be so cheap if it weren’t for child labor? How else could our fast food so cheap if it weren’t for dehumanizing wages? The list goes on and on. Unless we curve our insatiable need for “stuff” and change our lifestyle, these atrocities will continue to happen to the poorest in society. As St. John Chrysostom writes, “Not to share one’s wealth with the poor is to steal from them and to take away their livelihood. It is not our own goods which we hold, but theirs.” I believe very strongly that the extra coat one has in one’s closet belongs to the poor; to keep it unused in one’s closet rather than giving it to the poor is a grave sin. So pervasive are these issues that they in fact take on a structural nature. As Pope Francis writes in his latest papal encyclical Evangelii Gaudiam, reiterating years of papal teaching, these structures need to be challenged. 4. 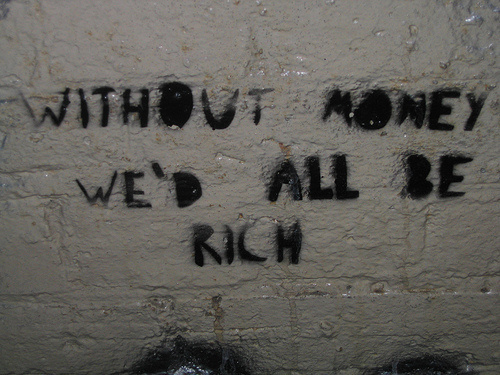 Wealth too easily becomes a false god. Which brings us to the fourth and final reason to live a life of poverty: you cannot serve both God and mammon. The reason that our economic system in the west is so detrimental to the poor is because it has replaces God with money, a transition that is easy to make and difficult to break. On the one hand there are those who have made it their life’s pursuit to acquire money, equating wealth with happiness. This is a sad state of affairs. Many people fail to recognize that money cannot satisfy such an insatiable appetite, leading some to resort to morally reprehensible things to obtain or maintain wealth. The answer, however, is not to become a miser, refusing to spend one’s money on anything. Ironically enough, this is also a form of idolatry because it takes an exorbitant amount of time and energy away from things that actually matter. It is because of all of this that I choose a life of poverty. I choose to imitate Jesus as closely as I can; to obey his word; to reject any system that may inhibit the authentic human development of my brothers and sisters; and to do all that I can do keep the Trinitarian God as my one and true God. I choose to live a life that is simple, without the distractions of useless possessions and futile pursuits. I choose to live a life that focuses entirely on a life with Jesus. That is why I choose to life a life of poverty. Now how do I do that? The next post will attempt to answer jus that. Reblogged this on charleyofs's Blog. Now, what would say is that level of poverty that promotes virtues?